Pre-heat oven to 200 degrees C (400 degrees F). Combine all dry ingredients in a large bowl (not the butter or strawberries). Add the melted butter and stir to combine, then use your hands to make sure its all incorporated. The mixture should form a large ball when you press it together. (If it is crumbling apart you may need a little more butter). Take 3/4 of the mixture and press into a slice tray sized 25cm x 18cm, lined with baking paper. Press down really firmly with your hands. Wash and slice the strawberries. Place on top of your slice and then take the remaining mixture and sprinkle over the top. Press down with your hands again. Its fine if there are strawberries poking though the mixture. Bake for 30-35 minters or until lovely and golden. Allow to cool on the bench and then place in the fridge. Slice and serve. Makes 15 squares. Suitable to freeze. I love this blog! I have 9 children so your pictures took me back! Adorable and yummy recipes! It’s almost impossible to not comment on the cutest little hand and handsome little boy!! The photos are gorgeous!! Great recipe and even better photos! Thanks for sharing. 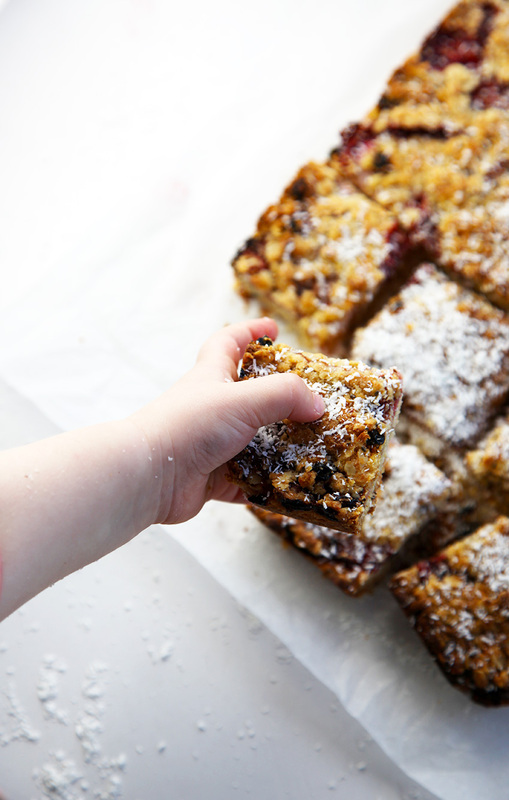 These look like delicious bars…and I love that cute chubby little hand! I love baby hands in food photos!! My daughters’ hands are in a bunch of the food photos on my blog too :) These squares look great!! My 15 month old’s hands are always entering my pictures too! These look like they taste so good, yumming this one! Thanks so much Sara, yes they definite taste good and they are so easy. Thanks for stopping by. Secondly, this recipe sounds like the perfect breakfast/brunch treat. I’m sure it would be delicious with raspberries or peaches as well (we have such an abundance of peaches right now). This sounds like a great idea for breakfast…I’m a grab-and-go girl. Thanks! I’ll be saving this! Thanks Hillary, yes they would be perfect for breakfast or a quick snack. They freeze really well so you can just grab one out of the freezer on your way out. 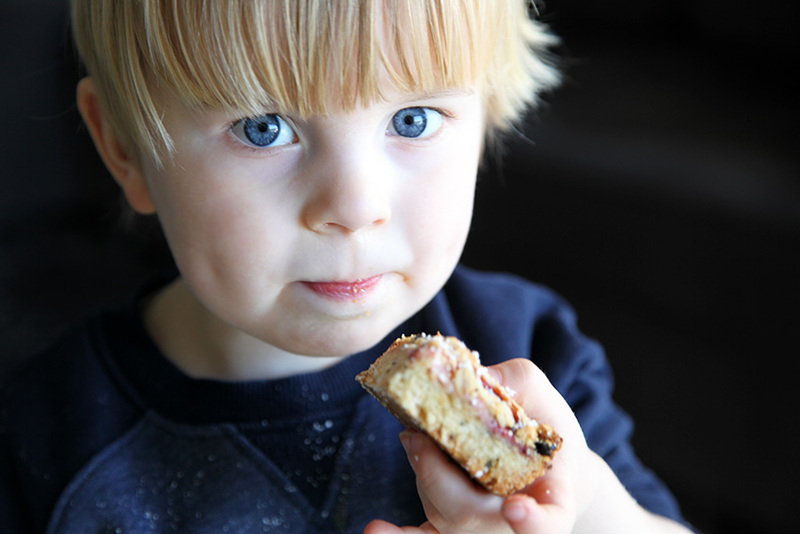 Thanks Becky, my little taste tester most definitely agrees – but he likes just about everything I make! This looks great! My kids would probably love these. School starts on Monday so it would be a great snack for them to take. 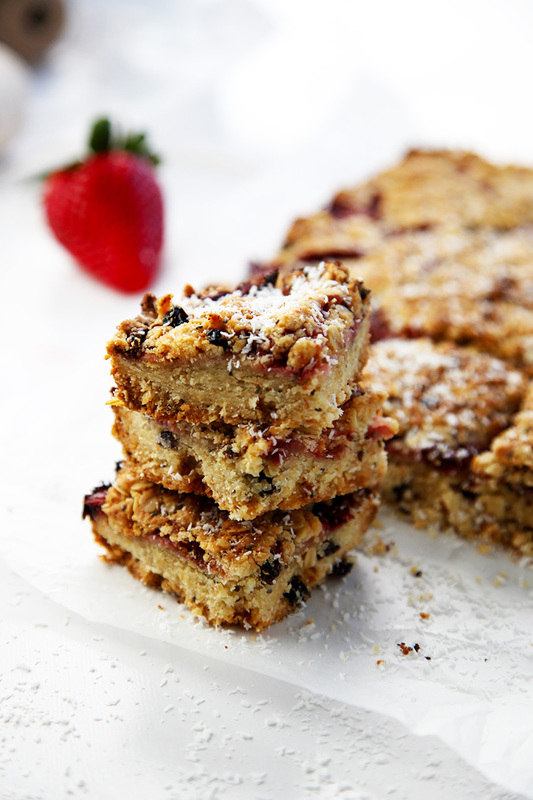 These museli squares look delicious…such lovely flavours. Easy for me to veganize too! I love the picture of I am guessing your son….it’s so lovely! Great Recipe! I made these for my 1 yr old and they are a hit! How long do they keep for in the fridge, 3 days? Cristie… I thing that your son will be involed on the blog world soon. He looks cool and familiar with the camera. p.s. Love this recipe!